As most of you know, I have a young son, Lucas, he's now 4 1/2 and beginning to draw a lot. And what does he love to draw? Cars, all day long - cars. Plus, he watches "Cars" a lot on his iPad, so I figured this would be the perfect time for him to enjoy the new Pixar feature film, "Cars 3". We went to my local multiplex, loaded up on popcorn, Coke and hot dogs, and settled into our La-Z-Boy leather chairs to enjoy the film. 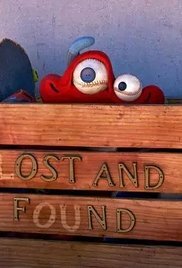 It was preceded by the new Pixar short, "Lou", directed by Dave Mullins - it's a crudely animated look at articles in a "lost and found" box getting revenge on a schoolyard bully. Very ho-hum. 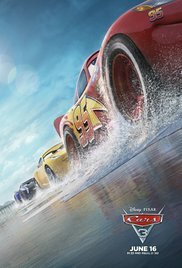 "Cars 3" the feature started off with a bang, as Lightning McQueen loses his mojo, and the race, and has serious identity problems. From then on, the film goes downhill - too much talking and psycho-analyzing. So after Lucas finished his hot dog and popcorn, he was ready to go home. For both me and Lucas, the best part was the demolition derby that Lightning gets stuck in, where he is chased by a demonic fire-breathing school bus. That was hilarious. Lucas and I both give "Cars 3" a low C- grade. But who cares, the film will drive a new generation of boys to buy more "Cars" merch - and it will probably make a billion dollars.